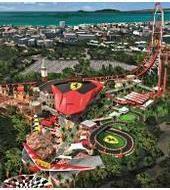 Don't miss Ferrari Land, the new theme park unique in Europe which arrives soon at PortAventura World. Enjoy 70,000 m2 of speed, innovation, adrenaline, theming and internationally-renowned attractions such as the highest and fastest vertical accelerator in Europe. Visit us for an unparalleled experience for the whole family that will certainly leave an impression! PortAventura World: Ferrari Land & PortAventura Park. You must enter Ferrari Land through its main entrance on the selected day and within the chosen time slot. On this day, you will be able to access PortAventura Park during its opening hours. This entrance also includes a full day access to PortAventura Park within its opening time and it will be able to be chosen between the previous or the forward day to your entrance to Ferrari Land. Print a confirmation sent to you after purchasing online and hand it in together with identification in the park.